In his lifetime and, to some extent, in the 21st century, poet and novelist Samuel Woodworth was recognized for only two works: "The Old Oaken Bucket" and "The Hunters of Kentucky," both of which were set to music. The latter was even used by Andrew Jackson as a campaign song for the Presidency. 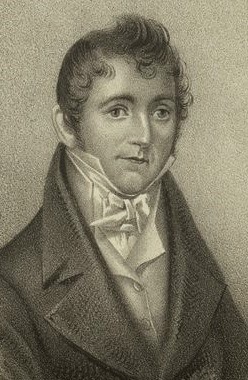 He had been born in Massachusetts, the son of a veteran of the Revolutionary War, before starting his literary career in Connecticut using the pseudonym Selim. He relocated again to New York City where he married, fathered ten children, and lived the rest of his life. He became a Swedenborgian and frequently contributed to publications like the New York Mirror. In 1836, he suffered what is assumed to be a stroke that resulted in partial paralysis. He died on December 9, 1842 at the age of 58 and was buried in New York. But Samuel Woodworth's story did not end there. Woodworth's son Selim Woodworth (named after his father's nom de plume) joined the Navy and relocated to the west coast. Selim was aware of a cemetery opened in San Francisco in 1854 in the rural garden style of various east coast cities, originally named Lone Mountain Cemetery. Even before it was renamed Laurel Hill Cemetery, it had become the fashionable spot for the well-to-do deceased. 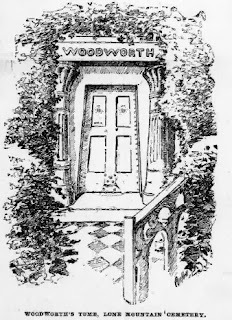 In 1864, over 20 years after his death, Samuel Woodworth was brought here for reburial by his son. His Egyptian revival tomb, covered with ivy, became one of several tombs frequently visited by the living. By the turn of the century, however, new regulations in San Francisco forced the relocation of several cemeteries. By 1937, Laurel Hill Cemetery was shutting down and Woodworth, like so thousands of others, had to be deposited elsewhere. His descendents were somewhat horrified at how frequently his remains had been disturbed. He was cremated (something his sons considered as early as the 1890s), his ashes scattered, and his impressive tomb at Laurel Hill left behind to decay or be destroyed as the city developed. My reck'ning was ever a-miss. And struck on the rocks of despair. Her smile bids the tempest subside. To moor in the stream of delight. I'll never evade it, by Jove! Nor traffic in contraband ware.